Kofi Annan, Joint Special Envoy of the United Nations and the League of Arab States on the Syrian Crisis. The Security Council today voiced grave concern at the deteriorating situation in Syria and called on its Government and opposition to immediately implement a plan proposed by the international envoy tasked with helping end the crisis in the Middle Eastern country. To this end, it fully supported the initial six-point proposal submitted by Mr. Annan during his visit to Damascus earlier this month. Secretary-General Ban Ki-moon strongly welcomed the “clear and unified” message sent by the Council with today’s action. “As the situation continues to deteriorate on the ground, it is more urgent than ever to find a solution that will end the tragic suffering of the Syrian people,” his spokesperson said in a statement. “The Secretary-General hopes that this united action by the Council on Syria can mark a turning point in the international community’s response to this crisis,” it added. During the visit, Mr. Annan urged Syria’s President Bashar al-Assad to take concrete steps to end the crisis and put forward proposals to stop the violence and the killing, give access to humanitarian agencies, release detainees, and start an inclusive political dialogue to address the legitimate aspirations and concerns of the people. “The Security Council calls upon the Syrian Government and opposition to work in good faith with the envoy towards a peaceful settlement of the Syrian crisis and to implement fully and immediately his initial six-point proposal,” the statement added. The Council also said it will consider “further steps as appropriate” based on any progress reported by Mr. Annan on his mission. The UN estimates that more than 8,000 people, mostly civilians, have been killed and tens of thousands displaced since the uprising – part of the broader Arab Spring movement across North Africa and the Middle East – began in March last year. There are currently two missions in the Syrian capital, Damascus, addressing the crisis: a team of experts that is discussing ways to implement the six-point proposal, and a humanitarian team that – along with the OIC (Organization of Islamic Cooperation) – is assessing the humanitarian needs in the country. Separately, the Council issued a statement to the press today in which it strongly condemned the terrorist attacks that occurred in Damascus, on 17 and 19 March, and in Aleppo on 18 March, causing scores of deaths and injuries. In the press statement, the Council members expressed “their deep sympathy and sincere condolences to the victims of these heinous acts and to their families” and reiterated their determination to combat all forms of terrorism, in line with the Council’s responsibilities under the UN Charter. 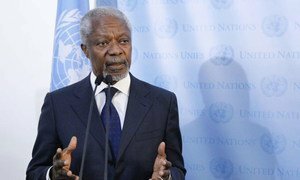 The Joint Special Envoy of the United Nations and the League of Arab States for Syria, Kofi Annan, today urged Syria's President Bashar al-Assad to take “concrete steps” to end the current crisis in the Middle Eastern country.